Incorporating medical items a child might be seeing, feeling or hearing into play can help her to understand the function and reason for their use, which can ease anxiety and clear misconceptions. By familiarizing and allowing manipulation of real medical equipment and materials, children can gain mastery over their own medical experiences. Children can learn to cope with new and familiar experiences through play. 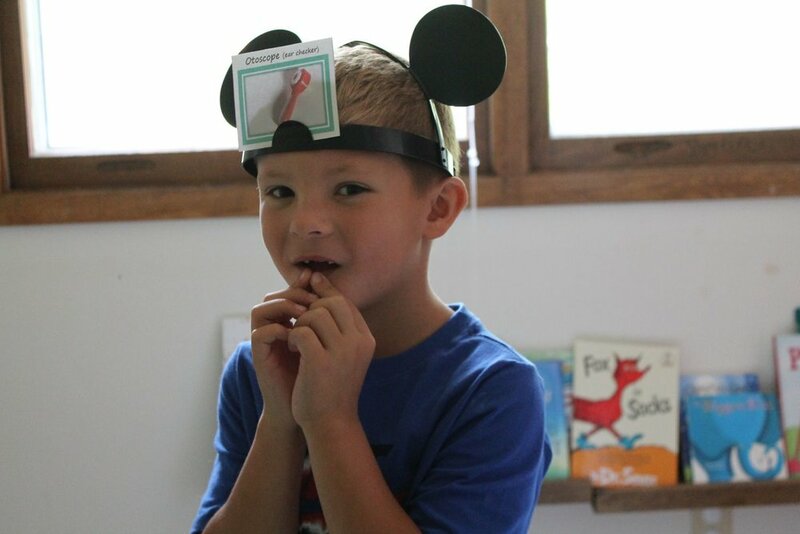 Children explore and manipulate medical items through this shape sorting game, leading to open-ended medical play fun! 1. Collect medical items in the hospital room, playroom, or from past doctor visits that can easily be identified as being circular, square, rectangular or triangular in shape. 2. I used painter’s tape on a newly washed floor, but another option is to draw out the shapes on pieces of construction paper taped together. Presenting learning concepts in a novel way is more interesting to the young child, so have fun with it. You could even construct the shapes out of other recycled items, such as expired tubing or ice pop sticks (resembling tongue depressors). 3. Identify/review what each shape is with your child and explain the game in simple terms. “In this game, you have to find triangle shapes out of these “doctor” items and put them in the large triangle.” And so on. Two year old showing shape of band-aid to mom during learning activity. It’s okay if they don’t get many “correct.” This activity is intended to help familiarize young children with medical equipment names and practice shape recognition. While it starts as a guided activity, it is still intended to be an opportunity to allow them control, which is what toddlers developmentally strive for at this stage. Being hospitalized can be very restricting and kids often have a challenging time coping for this reason. This is intended to be fun and an opportunity to lead into open-ended medical play for children. Follow along on Instagram to see more photos and videos! Share your experiences with medical play below! Time for a check up! Four year old engaged in medical play on a night light stuffed animal.